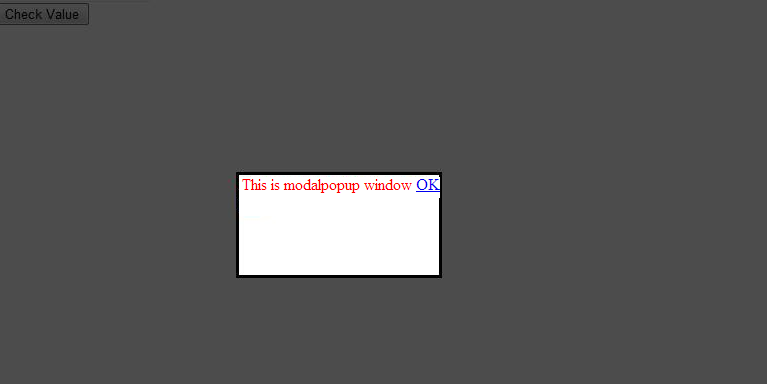 In Ajax control toolkit, you find many fantastic controls, one of them is "ModalPopupExtender". This extender is not always a desirable choice to use because sometimes you are not using control kit in your project. Its nothing but a page that is inaccessible because it is cover with div having z-index (Like of 3D) set to make it blocking. The opacity of overlaying div can be set to make it see through so that you can seen in background but blurred and frozen. Another div is also present in same page (hidden by default) becomes visible and its z-index is set higher than that of overlaying div making it clearly and also accessible. Create a website in Visual Studio or Visual Web Developer and there you see a .aspx page named as (Default.aspx). Open Default.aspx page, here we need controls like (1 TextBox and 1 Button. 2 Div's, we'll use one div for display as modal popup and other to overlay screen). After button clicked, DisplayModal function will be called which will set the CSS class of both overlay and modalmessage div. CSS class takes care of giving appropriate effect. The RemoveModal function used by "OK" button present in modal popup window to vanish the effect.